A Pace Advantage member, "Quarter Crack," posted a great link to DRF archives that go way way back in time. Sure, the nostalgia of looking at past performances and charts that go back to the late 1800's is a great way to kill time, but I immediately to it upon myself to search the term "takeout." The two earliest articles available are the most telling, and one can trace the demise of horse racing that we see now, to the words that were printed in 1935 and 1953 respectively. per cent. The smaller take, the better. Can you say Holy Cow? California racetracks were getting around 8% of every dollar bet on horses back in 1935. Yes, the tracks had a good gripe against the government trying to get more of a cut back then. But at 10%, it is no wonder that the stands were full, even though America was just getting out of a recession. Nowadays, many states have reduced their share of the cut from the pie dramatically. Around 12 years ago, Ontario opted to remove their 7% of what they were taking on each bet. Of course, the ORC, now WEG, didn't reduce takeout by that amount. They just scooped it. Now Woodbine cries that they had to increase the takeout on Tracknet, Magna, and California tracks to 27% on triactors (even though Churchill and Keeneland have a takeout on triactor of 19%). They pay a whopping 1.3% on each bet to the government. Sure, 4% on triactors goes to the breeding program, but they wind up splitting the remaining 22% with the purse accounts. Can you imagine that back in 1935, they would be splitting 8%? And guess what?, people would be betting like crazy today, like they did back then. ...The report of the Committee on State Revenues was of particular interest to the large assemblage of turf solons and representatives of various other organizations within racing, for the spiraling taxation has disturbing implications to those in every phase of racing and bloodstock production. This report was presented by Michigan's James H. Inglis. long term health of the sport." in 1952 to 15 percent. The descending escalator clause in New York, was also abandoned and there can be no relief from the 15 per cent by just waiting for it. there isn't time to analyze these factors here. Yet, it should be emphasized that the decision in New York has had and will continue to have serious effects in other states, because whether we like it or not, many other states look to New York for leadership in legislation of this type. can point to the 15 per cent takeout in New York and Florida and a 14 percent takeout in Illinois, all three being important racing states. parade. The new act in Michigan has not yet been signed but it calls for an increase in the takeout from 11 to 12 per cent for thoroughbred tracks and an increase from 11 to 13 per cent for harness meetings. Ohio has boosted the take out from 10 to 12 per cent and in Massachusetts the increase has been from 12 to 14 percent. larger track commissions or other legislative gains. package which includes gains for the racing associations. commission the power to control price gouging by race track concessionaires. I regret to say that some racing associations have played this game in their legislative campaigns. Thus we get back to this familiar and disturbing fact of racing. This is the fact that in the power politics of racing between the horsemen the organized employees. the racing associations, and the financially hard pressed state governments, every element of racing is able to force a larger slice of the pie for himself, except the racing fan, the all important lover and patron of the sport, who in the last analysis, is the man who keeps the show on the road. climb year after year. Since 1946,for example, the total handle has climbed from 1,830,000,000 to 2,326,000,000 last year, and state revenues have climbed from 93,800,000 in 1946 to 14,2500,000 last year. How Much Will Fans Stand? racing fans will continue to allow themselves to be imposed upon. tax rate increases among the several states. a graduated tax rate based upon the amount of the handle? lets gather the complete facts. The gain in handle from 1946 to 1952 wasn't all that much (27% over 7 years), when you take inflation into account. From the end of 1946 to the end of 1952, the CPI rose by just over 24%. And lets not forget, the war was over, and North America was in an optimistic growth mode. A dollar back in 1950 is worth around $8.50 today. This means that if racing stayed even with inflation since then, total hand would be around $20 billion. Right now it sits around $13 billion, and that includes the heavy increase that happened when internet betting was introduced. Meanwhile, track takeout has increased to an average of around 21% today, from the 12% average that apparently was there in the early 50's. Where has it got them? Racing can't even keep up with inflation. As for studies regarding optimal takeout. A very important one was done back in 2004. The Cummings Report does not state what that takeout is, but he concludes that it is a lot less than what is out there today. It is great to see the acknowledgment by Inglis, that the horseplayer is one who "keeps the show on the road." Great article at HANA "So Players Don't Care About Takeout, Huh?" Well worth reading, as it crushes the excuse that most bettors don't care or realize what takeout is. Though that might be true, the article clearly points out that most players are affected by takeout whether they care or not. For the link to the Daily Racing Form Archives, it is available at this Pace Advantage thread. It is from 1951. Shows the dangers of getting hooked on betting horses:) Love the crowd scenes. Brings back memories from the 60's and 70's at Woodbine, Greenwood, and Fort Erie, when the stands were full of enthusiastic bettors. The big crowds disappeared with lower takeouts. A couple of notes about the movie. Barbara (Beaver's Mom) Billingsley has a small part as a secretary. And the nerdy "teen" who hangs around the main character's home drooling over one of his daughters is none other than the kid who played Alphalfa in the Little Rascals series, Carl Switzer. If you like the information found on this blog, and you are a horseplayer, please join HANA, it is free, and it will take you less than two minutes to fill out the form. Don't forget to check out the new ADW Horseplayersbet.com, if you want to maximize your chances of beating the horses. Unfortunately, Horseplayersbet does not take Canadian customers. Too Funny: Ontario Man Wins A $4.4 Million Lottery Jackpot. He collected his check, posed for the camera, walked out of the OLG offices, and was quickly nabbed by police officers because "he was wanted on a six-year-old warrant for failing to appear, theft under $5,000 and possession of property obtained by crime." Seems the OLG ratted him out after they did a security check on the winner. They do these checks now whenever they are suspicious, because of all the bad press they received over the fact that a disproportionate amount of big winners were found to be ticket sellers (and ticket checkers, of course). Sports Betting In Delaware: The four major pro sports leagues and the NCAA sued Delaware Friday, seeking to block the state from implementing sports betting. The lunacy of these sports leagues is mind numbing. Like sports betting doesn't happen already? It is just like prostitution and marijuana as far as I'm concerned, legalize it, and that way the government can make some extra money. The NFL especially is laughable to pride itself on the say no to legalized gambling on sports in the USA. First off, Vegas already has legalized gambling on the NFL, so the monkey is already out of the cage. Secondly, if betting and Fantasy Football leagues (which is gambling as far as I'm concerned), didn't exist, the NFL might be just as dead as horse racing is now. I love watching the NFL, but if I didn't have a bet going and/or fantasy players to root for, I would rather be watching The Antiques Road Show. Are Frank Stronach's alleged financial shenanigans finally going to be fully exposed? It looks like a good possibility that his house of cards will be analyzed, and I think it could get ugly. Town of Fort Erie gets $325,000 from quarter one slots revenue. Last year, the town received just over $1.3 million for the year, so it seems that revenues have at least stabilized at the bottom, unfortunately, but at least this might be the bottom. Seems like those who buy in to play in the big handicapping tournaments have stopped betting through Vegas, and are making their large plays through ADWs that offer rebates. First off, that is how almost all big players play. And why not? You get an average 7% rebate and you bet a million a year, that is $70,000 in extra money to play with. Also, if the rebates didn't exist, these players would probably betting only $1-200,000 tops, but that is another story. But Eng is right. The ones who put on these tournaments need to at least break even, and it isn't a terrible request to make it so that monies bet on the tournament go through the hotel. And the method outline by Eng makes perfect sense. It is a choice for the player to even pay to be in the tournament in the first place, and they can always play from home and forget the tournament and simply just get their rebates on every bet. Choice is important for the player. As long as it exists, I'm happy. Speaking of tournaments, in the recent one held in Vegas, a California horseplayer just set a tournament record. "On June 3, one of the WEG teletheatres in Brampton was robbed. Tellers and 20 patrons relieved of cash. O n July 6, the other WEG location in Brampton was robbed. The teller(s) and 3 patrons relieved of cash." "The total money illegally stolen was reportedly just under $50,000." I'm doing this as a public service to patrons who haven't been able to read a thing about it in any Greater Toronto Area newspaper. They should know that there is now a real danger in going to a teletheatre right now. One can speculate why this hasn't made the newspapers. Woodbine does a lot of newspaper and television advertising, and thus they wield clout when it comes to having bad publicity not make it to the newspapers and television. By not making this public the first time, the teletheatres were even more at risk to be hit the second time around, especially if the crimes were committed by the same robber(s). If I was robbed in the second robbery, and knew that there was a cover up on the first robbery on purpose, I might go after those responsible for the cover up, because I may not have gone to a teletheatre until arrests were made on the first robbery. If there is an armed robbery of a bank, it makes news. Why is that? They (scientists) discovered the jockeys' crouch lets them isolate their bodies from the horse's movement — the horse is moving up and down a lot more than its rider. When the horse's feet hit the ground, its motion temporarily slows until accelerating again with push-off. Through incredible effort that makes the jockey's legs act like a spring, his or her mass stays at a more constant speed. It's basic physics. "The jockey adds weight but not inertia to the horse," explained research fellow Andrew Spence, a study co-author. The jockeys "say things like, 'You need to go with the flow of the horse.' ... The neat part of the study is we've shown how that happens mechanically." Still, I contend that horses are capable of running fastest without jockeys and their weight. And I'm also convinced that what we call a good ride, is really a ride where the jockey makes the least mistakes. For proof, over the years I've seen quite a few horses finish ahead of the field after dumping the rider early in the race, even if the horse had very little chance to win the race on paper. 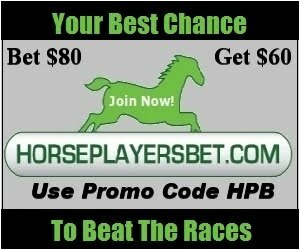 HPBet (Horseplayersbet.com) is a pari-mutuel Advanced Deposit Wagering (ADW) service, providing legal, secure and user-friendly online and phone account wagering, powered by eBet Technologies, Inc. through its fully licensed Multi-Jurisdictional Account Wagering Hub in the State of Oregon. All wagers placed through HPBet are commingled with partnered Host Track pari-mutuel pools. HPBet offers one of the most competitive Player Rewards Programs available for horse racing product. At HPBet, even the smallest bettors have the potential to become the biggest. Easy to use wagering interface. Free video stream for active members and more. Today's Hot Topic On Pace Advantage: Can Sports Betting on Track and Satellite Save Racing? Ajax Downs VP of Corporate Affairs Nick Coukos was recently interviewed on Trot Radio. He was asked a variety of questions including many to do with the future of the track. He stated that the reason they are in the midst of making it a 5 furlong track is because they want to be ready in case they get the opportunity to race standardbreds or thoroughbreds. Standardbreds? Plenty of standardbred tracks in Ontario. But thoroughbred? Is Ajax Downs getting ready to fill the niche that Ontario horsemen will need if Fort Erie decides to close their doors? That is a strong possibility. Very strong. With Stronach tracks being auctioned off shortly, the few groups or people interested in owning a track will be able to get in and most likely be able to get a nice discount. This coupled with the fact that Nordic has always over priced Fort Erie, I just don't see anyone willing to pay Nordic's price. When Stronach tracks do sell, the prices they go for might thrust the price Nordic wants into reality. I said might. One thing is for sure, I don't see there being any money left for Nordic to get handed to them after this year. And I doubt they will operate if they are indeed losing money. The only way I see Nordic operating Fort Erie next year is if the OLG gives them a better cut on slot revenues, and if that could happen, it most likely would have happened earlier this year. Back to Ajax. They only do around $15,000 in handle a day, but they aren't exporting their signal yet. Coukos said he expects to do that by the end of this year (which probably means the beginning of next year). He says he feels there is only one chance when it comes to marketing his product outside of live racing, and he wants to make sure he does it when the time is right. Coukos brags that Ajax is giving away in purses more than what Fort Erie is giving a way in purses each racing day. What I found most interesting is that he said that it only costs around half to train a quarter horse as it does a thoroughbred. Does he mean a thoroughbred at Woodbine where the rates are around $80 a day on average, or half of what the rates are at Fort Erie, which averages around $50 a day. There is an unconfirmed rumour regarding the additional 500 plus slots that Ajax just received: The horsemen will get zilch from those machines. Again, I just don't see why they offered up the voluntary program then. Didn't they assume responsibility by just having the exclusion program in the first place? It all depends on how the program form was worded when they first implemented it. I'm sure the OLG changed the wording since the beginning. And if they aren't responsible, why are they testing out facial recognition technology soon? A trainer gets a 5 YEAR BAN for milk shaking a horse that wound up finishing fifth. It was his third offense. Too bad they aren't so tough on cheating trainers in North America. "Timebomb" a Windsor Ontario racefan has been on a crusade to get the judges of harness racing in the province to call infractions based on the rulebook. If it is in the rulebook and it is not called (the fines and suspensions are published via the web at Standardbred Canada) he is making sure people know about it. I think that all claimed horses should be tested, and the industry, not the new claiming outfit, should pay for the tests. Most claimed horses are top performers. They are most likely to be benefiting from performance enhancing drugs. Why have an added expense tacked on to someone who is willing to take a chance claiming a horse? Integrity should override everything, and these tests should be mandatory, and it is unfair to burden the new owner with this expense. "Mr. Swinhoe (another commenter) don't waste your money. The sport has really cleaned up it's act or the testing is inadequate to find these types of drugs. Same old story, let the buyer beware, you have a 99-1 shot to finding drugs in a horses system with the testing the way it is." Great Article: Lasix May Help Some Horses, But Is It Worth It? Bill Finley may doubt if Lasix works at all. A recent study may have put his doubts to bed, as it did show that Lasix does what it is supposed to do: reduces exercise-induced pulmonary hemorrhage (EIPH) in racehorses. But what else does Lasix do? Oh come over 95% of horses that run in Canada and the US are on it and in every other jurisdiction in the world, it is not needed? Is it worth the fact that it masks other drugs, and enhances performance, and makes it so that horses who end up using Lasix to run fast (either through anti-bleeding or drug masking) become possible stud and broodmare prospects, who most probably weaken the breed by passing on inheritable flaws to the next generation of horses? "One interesting aside was that respondents appeared troubled by the “perception” that late-odds drops were the result of past-posting. Sadly, the only inference that can be drawn from that is that horseplayers seem to care more about how false perceptions hurt racing than regulators do." Many scams have come and gone where astute gamblers, in league with a teller or two, could make bets on contenders, and if the horse doesn't get out of the gate in a good manner, or even jump to the lead out of the gate, the teller simply cancels the ticket. The fact that this could still happen, is enough reason to close betting at zero minutes to post (the second the 1 MTP disappears). We've been picking pools that have been difficult to gauge of late, as to how much power this Pool Party idea has. This week we are going for broke. We really need support on this one. Early in our campaign we did a race from The Mountain, and according to our calculations we estimate we attracted $15,000 in new money. Please bet this race, because we want to blow that number away. Mountaineer Race 2 Handicapping Info including Past Performances, Thoro-Graph data here. Cory Clark on Facebook happily reports that her husband, jockey Chad Beckon, is heading to Toronto today to start rehab. Beckon was involved in a horrific accident a month ago in a horse race at Woodbine. Fun Thread On Pace Advantage: Who Is Your Favorite Female Reporter/Analyst In Racing? Note to Internet Explorer uses. There is a problem with IE and Blogger right now. If you get an abort message, click OK. You will be sent to a page asking if you want to do diagnostics. Simply click the back button, and the IE issue will most likely be resolved. This is why I use Mozilla Firefox. Thanks to everyone who participated including Cindy Pierson Dulay who runs Horse-Races.net and About.com: Horse Racing, Jocko Lauzon, Peter Gross (Down The Stretch Newspaper), Kevin Attard (the best dressed guy at The Fort yesterday), Daryl Wells Jr., Jim Thibert (who waved at the end), and all the rest. Cub reporter Perry Lefko was also very helpful in the making of the video. The track was absolutely the most speed favoring one of the year and the rail was golden, yet the pace was very slow in the Prince Of Wales. The fastest early pace horse, on form, in the race, Mr. Foricos Two U decide to rate. Why? Was that Mike Smith's decision or the outfit's decision? Or was the horse just off his game? As I stated in my post handicapping the race, my biggest concern with this horse was his breeding. Porto Foricos horses are not great routers. They are more inclined to be 6-7 furlong horses. This one has shown that he can go around two turns though, but I haven't seen very many do so, especially at Fort Erie. I had him pegged as the lone speed in the race, and the track came up perfect for him. He at least stayed near the rail most of the race, but he had no chance yesterday trying to stalk. And what is with Eye Of The Leopard deciding not train at least once at Fort Erie? Horrible move. As Elissa Blowe rightfully points out almost daily when doing the handicapping at Fort Erie, horses dropping in from Woodbine many times don't do so well their first time racing at The Fort. By shipping and running The Leopard, it may very well cost him the Triple Crown This Year. That being said, the track totally played against him yesterday, and if the track was playing fair, he might have won regardless of his connection's blunder. Stewart Elliot on Milwaukee Appeal did the right thing early by grabbing the lead on the inside going into the first turn, but then blew the race by allowing Gallant not only take over the lead but also let Corey Fraser grab the rail. The filly still did run a very game race. She could be the second best 3 year old filly in North America right now, which still means she could be 16 lengths inferior to Rachel Alexandra. It was a masterful ride on Gallant by Corey Fraser who out rode the rest of the jockeys in the race. There was tremendous drama during the extra long wait as the judges tried to figure out who won the race. I was 90% sure, Milwaukee Appeal won it after watching the stretch replay 3 or 4 times, though when I watched the race, I was a little past the wire, and it seemed Gallant was in front at that time. When Peter Kyte finally announced that Gallant had won, there was probably not a happier person on the planet than Niagara Falls native, jockey Corey Fraser. Great race no matter how you slice it. Since the Pick 6 only usually only got around $1,000-$3,000 in new money prior to Woodbine's Turbo Charge experiment, I can only conclude that many bettors were duped into thinking that Woodbine was still seeding the pools. The small field sizes offered, coupled with most people knowing the Turbo Charged Pick 6 was no more, resulted in a pathetic $2.1 million in handle at Woodbine yesterday. The Prince Of Wales runs tomorrow at The Fort. Although it only has 6 horses, I can see numerous outcomes. It is a tough race. Horses who do well at distances on the Poly don't necessarily have the edge on a dirt track going a distance of ground. I'm still not on the Eye of the Leopard bandwagon, so I'm leaning to the filly, Milwaukee Appeal who figured to bounce a bit in her last race. She does have the best numbers going into this race from two and three starts ago. The Leopard may in fact bounce too, as Sam Son Farms horses are usually aggressively trained and aren't use to running three tough races in just forty odd days. Mr. Foricos Two U looks like he'll be able to control the pace, but his sire (as a route sire) turned me off him last time and I'm not about to jump on him here, though he could hang in for third. I still think Keino West is going to move forward. He was way too far back last time out. If speed comes back, I can see him getting into the second or third. I did pick the exactor last year, so I'm definitely not due tomorrow. Only 76 horses are racing in 10 races at Woodbine tomorrow barring scratches. Good day to avoid their high takeouts....at least in theory. Even Fort Erie has them beaten out with 78 horses entered tomorrow on Wales Day. The article is mostly to do with pool integrity, an issue that HANA is about to be all over soon. "I argued with the industry official that the majority of players would prefer wagering to be stopped at post time, that even though odds will continue to change late, horseplayers would prefer to know the closing odds before a race starts." With Nick Coukos there, Ajax has a perfect chance to grow their betting product. Right now there is an average of around $1500 bet on a race. No real exposure at all. They can change that in a hurry. An experimental test will be conducted in September. This is of course too late in regards to the large lawsuits against the organization with problem gamblers who signed documents asking the OLG not to let them in. 10,000 people have signed up to be booted off the premises if spotted by OLG staff. I wonder what percentage these problem gamblers make up of the total revenues generated by places like Woodbine. If it is big, this could be the catalyst that brings down purses at WEG, and it might motivate the execs to try to really compete on the racing side. They might even get the horsemen to work with them. Horsemen in the USA right are like deer in the headlights. That could easily happen with the Woodbine horsemen. Fort Erie has already experienced that feeling, and unfortunately, that feeling isn't over and done with yet. Christine Papakyriakou wasn't one of Woodbine's customers. But she will be sentenced next month after being found guilty of stealing $7.4 million from wine company Andrew Peller Ltd. It seems the gambling bug got to her in a bad way. And instead of accepting responsibility that she is a just a criminal, she is looking at the OLG as being the scapegoat. How many Christine's play slots at Woodbine? Ohio has approved VLTs to be placed in the 7 Ohio race tracks. Those bible belters sure made it difficult, but many of them will be heading to the track now. Of course, that is what they were scared of in the first place. It hasn't been determined what percentage of VLT profits the tracks and horsemen will receive yet. Hopefully for them, it will be 10% for each. There purses are just pitiful now, and nobody has been more patient than Ohio tracks and horsemen. Really Cool Gadget: Streak Calculator; Determines the probability of losing a streak of wagers over the course of a wager series of specified length. Down The Stretch on-line has some really informative articles in its newest issue. Well, there is a now humiliating article on Woodbine's Turbo Charged Pick 6 that was obviously done before Woodbine wisely pulled the plug on this losing money fiasco. "(Sean) Pinsonneault and CFO Steve Mitchell may have dreamed this one up, but there's some logic behind it and when they ran it by President Nick Eaves and CEO David Willmot, there was almost immediate approval." Who would Donald Trump fire for this? Probably Willmot. He has the final say I believe. Lucky for Willmot, it is a private company and he is a Teflon CEO. But it is still nice to say "Willmot, you're fired." Budding cub reporter Perry Lefko has a more in depth article on the three suitors that Fort Erie has right now. TORONTO, July 8 - Woodbine Entertainment Group (WEG) is suspending its Turbo-charged Pick 6 wager promotion...for now. "We're putting the Turbo-charged aspect of the Pick 6 wager on hold, but are considering bringing it back for special events or something more regular later in the season," said Sean Pinsonneault, WEG's Vice-President of Wagering Services. The Turbo-charged Pick 6, a bet in which horseplayers are asked to select the winners of six consecutive races, was offered over three straight Sundays, beginning on June 21, the day of the 150th edition of the Queen's Plate. As promotion for the Turbo-charged Pick 6, WEG added $150,000 to the carryover. If the Pick 6 was won, the pool was re-seeded with another $150,000 for the following week. "We wanted to promote our Pick 6 wager and felt seeding the pool with $150,000 would raise eyebrows, and it sure did," continued Pinsonneault. "It created the buzz we were looking for and encouraged racing fans and horsemen that weren't already familiar with the Woodbine Thoroughbred product to experience our racing with consistently large fields and one of the largest purse structures in North American racing." The Turbo-charged Pick 6 was paid out on each Sunday the added $150,000 was offered. On the first afternoon (June 21) of the bet, one fan, from the United States, collected $203,499.40. On June 28, another American hit it for $153,884.20. On July 5, four happy fans, three from Canada and another from the U.S., had the Pick 6 for $46,982.90 each. "It would have been nice to see it carryover a few days from our perspective but clearly some pretty savvy players were able to walk away with some significant jackpots," said Pinsonneault, "and that's ultimately what we were trying to create. We're happy for those that cashed tickets on the Turbo-charged Pick 6." A $2 Pick 6 wager will remain on the Woodbine betting menu every Sunday without the seeded carryover beginning July 12 and continue to cover the final six races on the Thoroughbred card. Woodbine racing is available Wednesdays at 6:45 p.m. and Thursday through Sundays at 1 p.m. until December 6. Upon hearing that Woodbine dropped their Turbo Charged Pick 6 yesterday, my immediate action was this. As I stated here in previous posts, the Turbo Charged Pick 6 was a financial disaster. Woodbine was down over $400,000 (they got very little bottom line return on the $450,000 they seeded the three pools with), and their idea of getting a very large carryover was turning into a monumental task, not just because they got unlucky due to horseplayers cashing it every week, but because the $150,000 just didn't attract enough money to substantially build the pool even if it wasn't hit. Pinsonneault's comments about being happy for the bettor's who cashed couldn't be more disingenuous. Maybe he is getting ready for a career in politics. He didn't need to put that on the press release, he really didn't. And as for buzz, now more and more people know why bettors avoid Woodbine. Monstrous takeouts on triactors and high takeouts on other exotics. It isn't that people can't handicap the track. Much to Woodbine's chagrin, bettor's showed that poly or no poly, once some real money is thrown at their Pick 6, it can be cashed. I wonder if Steve Mitchell (he takes credit for coming up with this Pick 6 venture) is trying to gather up all The Game issues that he can find. And don't feel sorry for Woodbine or their execs. This was simply a bait and switch gone bad. Woodbine wanted to get people to start playing Woodbine with its ridiculously high takeouts by trying to get them to handicap the Pick 6 first. As for the execs, well as long as they have their lips on the boss's teats, their jobs are pretty secure. If Woodbine Entertainment was a publicly traded company though, almost every exec they have would have been gone a long long time ago, including their fearless leader. Woodbine knows how to run a monopoly. That is pretty much all they know. Problem is that they are no longer a monopoly, and they haven't been for 30 years. If they want to attract gamblers, they need to hire gamblers to run the place make all the crucial decisions regarding betting. A gambler may have told the guy who writes the condition book to put on a few bottom maiden claimers on Sunday. Those races wind up with big fields, and lots of chaos. Last night, there would hardly have been a ticket using the fifth winner. The first thing they have to do is to get their takeouts down to levels that appeal to all bettors. But they will never go that route under current management. If not for slots, current management at WEG would be hard up to find a job in the real world. Maybe, just maybe, they could get a job selling cold lemonade in the desert. That way they might be able to get away with charging the public ludicrous prices for their product. Ontario horse people are still mumbling in a negative manner over the fact that last Saturday, Woodbine carded a claiming race with only five betting interests (it was a 6 horse race, but two of the horses were owned by the same outfit, and thus an entry for betting purposes). No one is shocked though, because one of the entrants was owned by Woodbine's top vizuzu, David Willmot's Kinghaven Farms. Willmot's horse, aptly named, Forcefully, won the race by a schnoz in an exciting finish. It isn't uncommon for a five betting interest allowance race or non claiming maiden race to be carded when Woodbine is short on entries, but my (not so entirely great) memory doesn't recall a five betting interest claiming race ever get carded. You can go through the entry sheets for years, and not find that kind of thing happen. And it probably won't happen again for years....unless there is a Kinghaven horse entered perhaps. Good to see that Nick Coukos is still in the industry. He has landed the job of VP of Corporate Affairs at Ajax Downs. Good move by Ajax. Nick is a gambler, and thus understands the needs and psyche of the gambler. Not a good fit for Woodbine, but a good fit for any racing organization looking to achieve real success in the future. It almost looked like the race was destined to be run at Woodbine this year. This could be the last Prince of Wales at Fort Erie, as the track is still on death's door. Lets hope not. It is a beautiful track. Cronley points out that the dummies have stopped betting on horses for slots and lotteries, and now mostly what is left is smart handicappers who are betting against smart handicappers......at the same takeout that existed before the Dummy Exodus. Even smart handicappers are leaving though. Betting was down 17% in June. So now it really is a game that pits smart handicappers versus really smart handicapper/bettors....at an average takeout rate of 20%. If parimutuel betting on horse racing was invented tomorrow, the inventors would look around at the competition out there first, and there is no way that any bet would have a takeout of more than 12% absolutely tops. There isn't anyone out there saying anything positive about Ziadie and the current state of the game in regard to drug policies. How is Ziadie still training? His drug violation record should get him a spot on America's Most Wanted. The betting public is sick of the wrist slaps racing jurisdictions hand out to trainers these days. From track execs to horsemen to those who police the industry, racing is by far the most dysfunctional industry on this planet. If It Aint Broke D....Well Horse Racing Is Broke...Now What? Sure, those who have jobs as racing execs, but shouldn't, will blame the economy. Meanwhile, it hard to blame the economy when "Month to month, comparing only the Pennsylvania casinos that were open a year ago, revenues were up more than seven percent in June of this year over June of 2008." It is also hard to ignore the fact that when the economy was peaking, handle was dropping, albeit to a much lesser degree than what we've seen the past month, but dropping nonetheless. It has been stagnant to dropping for 7 years now. Oh wait, there were less race dates. But there was only a 2% reduction in dates, so that isn't a real good argument. The thing that might, and I say might, make the industry notice is that purses were down 6% in June. Yes, change is needed, and when the pocket books are hurt, change actually may happen. I wrote a piece back in November: Will The Recession Wake Up The Racing Industry? Personally, I think racing is starting to wake up, but it is still too dysfunctional to react in a positive manner. Read more at The Paulick Report and at Pace Advantage. It is great to read more and more articles, blog posts and forum comments on track takeout being the number one problem that horse racing has right now. I think blogs like this, and the awareness that HANA has spread in the past year has helped educate the public immensely. HANA has written a piece on Cary Fotias' views on takeout. “We have three interested parties at the moment, now we are just looking to find the right fit,” said Thibert. The first option, according to (Jim) Thibert, is an Ontario-based land development company that has owned a racetrack in the past. They are exploring full ownership or partnering with the not-for-profit group. The second potential investor is very interested and in the entertainment business. It apparently already owns a few racetracks in the United States and are experienced in that area. The third company is also Canadian based and is part of an international consortia that has a lot of experience in the gaming business. Regardless of which company they go with, Thibert says they’ll be pushing for a five-year deal. The thing is that when it comes to these potential investors, price is always an issue. The $35 million Thibert and Nordic Gaming came up with was a complete joke. It doesn't help future negotiations either. Nordic has a history of wanting waaaaaaaaaaaay too much for the track. Until that changes, the chances the track sells are next to nothing. Seriously, how much is a track worth that supposedly loses money even with slots? From a business standpoint? Nothing. How much is the land worth with a losing business? That is a tough one. Knowing what I know about Fort Erie and the real estate market there, I'm thinking no more than $10 million tops. If it wasn't for Woodbine's treatment of their customers (ramping up many triactor bets from other jurisdictions to a 25-27% takeout, while making it almost impossible for Canadians to bet through American ADWs where they could get half decent rebates, or at the very least, get the actual prices that many triactors pay), I'd actually feel sorry for them. They were able to attract just over $80,000 in new money as more players are starting to realize that there is value in the bet. But overall handle for the day wasn't all that good at $2.6 million, as horseplayers continue to avoid Woodbine's higher end takeout scheme (27% takeout on triactors, for example). It appears there were five winners yesterday. I wonder if any of them got some help from Horseplayersbet.com, who missed the first leg (it was a favorite though), but mentioned the next five winners, including 3 first choice winners (including the last race winner at 8-1). I had five of six again this week. This time spending $120. I only had it once this time and got back $176. I know it has only been going for two weeks, but early indications and analysis makes it look like the Turbo Charged Pick 6 will wind up to be a financial disaster for Woodbine Entertainment. They've been unlucky so far, as one jackpot winner emerged in both weeks. And this of course prevents the pool from getting gigantic and growing exponentially. But after last week, it looks like big pool growth will take quite a few weeks, much longer than first anticipated. Woodbine put in $150,000 into the Pick 6 pool on Queen's Plate Day (June 21st) added to a small carryover of around $3,000 that was already there. Woodbine pools are at least double that specific day compared to other Sundays, so the fact that $140,771 in new money was wagered on the Pick 6 represented a bit of an anomaly. Though I am not privy to the breakdown, but lets assume that 50% is bet in their home market through HPI, their home market tracks, and teletheatres, and 50% through US tracks, US ADWs, and Canadian non HPI home markets. When you factor in the US exchange, probably another $8-10,000 can be added to the pool total. So let says the total new money was $150,000 Canadian. The new $150,000 is broken down as follows: 75% goes into the pool (because of the 25% track takeout), so that means that the new money added $78,000 (70% of $112,500) to the $153,000 carryover, and this now represented a jackpot of approx. $231,000 Canadian to be distributed to those hitting 6 of 6, leaving another $34,000 to be distributed to those hitting 5 of 6. The Pick 6 was hit by one person and it paid $203,499.40. This means the winner was an American and paid in US funds. But lets look at Woodbine's bottom line: They put in $150,000. The total takeout was around $38,000. About $19,000 was generated on their own platform, but they only get around a third of the other $19,000 (their estimated signal fee). Because they split the takeout and signal fee with the horsemen, that means Woodbine generated back a mere $12,000 (if my math is right) for the track. Had the Pick 6 not be hit the first week, the $231,000 would have carried over. How much is a gambler more attracted to $231,000 over $150,000? Good question. I don't think it is that much. That makes what happened the second week very disillusioning, I assume, to Woodbine management. They had to put in another $150,000. This time, it was just a regular Sunday and the bet only attracted $51,388 in new money (let say $56,000 Canadian when factoring US exchange). This time the total takeout generated was only $14,000, and after taking into account their net after non home market share and horseman share, the track only netted around $5-6,000. So after two weeks, Woodbine Entertainment put in $300,000 only to get back $18,000. To make matters worse for Woodbine, one lucky American in Californian hit the Pick 6, forcing Woodbine to put in another $150,000 this week. But the dim reality is that even if it wasn't hit, the pool would only be sitting at around $172,000 instead of $150,000 that will be initially available this coming Sunday. One argument is that the Pick 6 will cause players, who weren't looking at Woodbine before, to start handicapping it now and betting other races, but it really didn't show on Sunday as only $2.4 million was wagered on the whole card, which again is pretty close to average for a Sunday at Woodbine. Before feeling sorry for Woodbine, lets remember that Woodbine is not doing this for the customer, they are doing it for themselves. This is the same Woodbine that recently ramped up the takeout on Tracknet, Magna, and California triactors. The same Woodbine that now gives its HPI customers $730 for a triactor that pays $810 at Churchill Downs. Question arise. Are bettors avoiding the Polytrack? Or are the bigger bettors staying away from Woodbine's high takeouts (even though they just reduced their takeout on triactors, the new 27% charge still ranks 6th highest in North America). It most likely is a combination of the two, but takeouts definitely need to go lower in order for more players to become interested in Woodbine. That or Woodbine needs to give bigger rebates to their customers, find ways to rebate those who use HPI in non home market areas, and also make their signal available to all rebate shops. Woodbine did have a very good Canada Day handle yesterday (over $3 million). They raced during the day. Normally on a Wednesday night, they usually have handles of around $1.3 million to $1.7 million (they usually just run 8 races). Maybe Woodbine should consider racing Wednesday during the day. There isn't a lot of competition as California is now dark on Wednesdays. In fact, Woodbine should maybe think about running Mondays and Tuesdays instead of the Thursdays and Fridays to avoid competition. Today (Thursday), they will be lucky to do $1.4 million in handle. On a personal note, I had a cheap thrill on Sunday. I bet $24 on the Pick 6. I used 2 horses by 3 horses (left out the 3-5 shot who ran up the track) by 1 horse by 1 horse by 1 horse by 2 horses. I hit the first five legs. But I didn't have the chalk in the last leg, and the chalk romped. The good thing is that I didn't finish second or third in the last race either, and what would have been worse would have been second beaten a neck or less. I did receive over $300, having 5 of 6 twice, but it would have been real nice taking home over $170,000 Canadian, if one my horses would have taken the last race. I though for sure that more people would have hit the Pick 6. The last four legs were chalk, and the first winner was only 5-1 (though the race was admittedly tough). The second leg must have knocked out the masses, and to me, the favorite, Retraceable, was at least 3 lengths inferior to my three top selections. The logical horses won the 3rd through 5th legs, but the fields were excellent in size. I used singles in those races and had the natural Pick 3. I tried to beat the favorite in the last (one of my live horses finished behind her in her last race), and it cost me $80,000. But I'm good at turning the page. The bettor who did hit the Pick 6 spent $576, more than 1% that was put into the pool as new money. One more thing. Note to Jeff Bratt: Don't say things like "lets hope no one wins it this week so that the pool will grow." I know you work for Woodbine, but you were talking to those who bet the Pick 6 on the day you said it. Basically you were telling Woodbine's customers that you hope they rip their tickets up. "thoroughbred racing will not prosper until takeout rates are significantly reduced." He goes on to make a very good comparison between the Old Boys network that used to control the stock market to the Old Boys network that still keeps horse racing behind the times. He also echoes my concerns about the negative perception customers have regarding past posting, and offers the same solution I do: Cut off betting 1 minute to post. I'll disagree with him regarding liquidity, because if takeouts are reduced significantly, liquidity will never be an issue again. If we horseplayers have enough passion to make our voices heard, we CAN make a difference. That’s why I encourage all if you to join the Horseplayers Association of North America (HANA) if you haven’t already. There is a link to the HANA homepage on the Equiform web site. I am on the HANA advisory board as I feel HANA has no other agenda except to improve our collective well being. I think the HANA “buycott” or “pool party” is a great way to enhance our bargaining power. Check it out - I think the only way we will be heard is to employ strategies that impact the tracks’ bottom lines. As a horseplayer, (Greg "Boomer") Wry brings a unique perspective while also serving as racing director. A handicapper tied closely to the racing community, he is a member of the Horseplayers Association of North America (HANA), whose 1,100 members put $41 million through betting windows last year. Making a horseplayer a racing director? Now that is what I call progress in a big way. I remember the old Ontario Jockey Club used to frown up their employees even making bets. They looked upon any bettor as being a degenerate, and unfortunately WEG is being run by someone who grew up with that attitude. To join HANA click here, it is free and it will take just a minute. The more members we have, the more clout we have.